"Man up". If there any more male shaming words than that? I have never heard it directly but one day at work I overheard a phone conversation that a female co-worker was having with her husband. That is what she said to him and I can only imagine how me felt. I have been told when young, "big boys don't cry. "; an equally demeaning comment stating you have no right to your emotion at the moment. Even the "you throw like a girl" hurt. Shamed. I have always wondered what would be the female shaming equivalent. I believe it was stated recently and we have been watching the results play out on a daily basis. 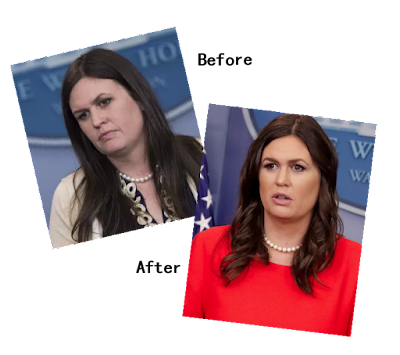 In my opinion, Sarah Huckabee Sanders was shamed by one very insensitive comment about her looks. For Sarah Huckabee, I want to do everything I can to make her better at that podium. I think she’s phenomenal there now. But like every athlete that is training for the Olympics, every day we have to make ourselves incrementally better, The only thing I ask Sarah — Sarah, if you’re watching, I loved the hair and makeup person we had on Friday, so I’d like to continue to use the hair and makeup person. First, let me say that Sarah Huckabee Sanders has an impossible job. She must present down and being up; north being south and present untruths as they are truth. Like her predecessor Shawn, time will judge her content. Did Scaramucci just state that she “was not feminine enough” or “She needed to look better on the podium? Did she need more makeup and a new hairstyle to be "incrementally better"? So very sad. Take a look at the before and after photos. Something changed. Women care more about their appearance because looks are more consequential for them. The key reason for this is that their appearance is central to how they are evaluated by others (Source psychology today).. When I am out as Rhonda I am insecure about how I look. One long look and I go down my list. “Too much makeup”; “not enough makeup”. “Oh no my hair does not look presentable.” The jewelry is overdone. What have I done wrong? A comment like Scaramucci's would be devastating. There was nothing wrong with the way Sarah Huckabee looked before. Her generation does not wear makeup the way we do. Whenever I see her how, I am reminded of a young girl playing dress-up. Or maybe someone that just had the super full-treatment at a department store cosmetic counter. Natural or less is better for daytime - Be yourself. The "shame on you" goes to Scaramucci, which might as well have said “Man up”, had Sarah been a man. The comments you note are 6 months old and gentle by comparison to the left wing smears against her just last week. Pulitzer prize winning 'journalist' David Horsey wrote that Sanders "does not look like the kind of woman" President Trump would choose because he prefers "sleek beauties with long legs and stiletto heels"..."Barbie dolls in short tight skirts". "By comparison Sanders looks more like a slightly chunky soccer mom who organizes snacks for the kids games". His comments which were published in the left leaning Los Angeles times added that "Rather than the fake eyelashes and formal dresses she puts on for the news briefings, Sanders seems as if she'd be more comfortable in sweats and running shoes.". Here we have a prize winning journalist, publishing in a major newspaper, a bigoted, sexist slam against a woman based on her weight and her choice of makeup and attire simply because she does not adhere to the left wing agenda. I will concede that it is possible that these snarky comments against Sanders were veiled snipes at the President. Horsey and the LA Times are not the only left leaners to take cheap shots at Sanders based on her appearance so while I agree with the philosophy of your post I think that you made a stretch to stick it to the long gone and almost completely forgotten Scaramucci rather than the ongoing barrage of cheap shots that have been heading her way from those who do not like her or the President. Thanks Pat for the comment. Anthony Scaramucci did it from within the White House. Friendly fire. As a TV commentator his comments and discourse was often amusing and interesting. Taking a job in the White House does call for some verbal filter and during his nano-second in the administration he showed that he had little to no filter.